The song 'Just one cornetto' started out as an adaptation of the Italian traditional 'O sole mio' in this television advert. 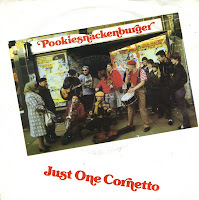 It was slightly rewritten and recorded by the Brighton retro/busker band Pookiesnackenburger, released as a single on Stiff records in 1982. Pookiesnackenburger consisted of Steve McNicholas, Sue Bradley, Paul Clark, John Helmer and Nick Dwyer. Although chart success eluded the band, they later morphed into Stomp, who went on to have international success with their theatre shows.